Crispy beef slices in a sweet salty sauce = heaven in the form of a stir fry. PF Chang’s copycat – done right! Paleo/Keto friendly. I cannot get enough of this Szechuan Style Beef . I am obsessed! For my British friends, PF Chang’s is an Asian themed restaurant chain in the US. They are everywhere – and is wildly popular over here. The problem is that the quality is pretty low, with many dishes containing additives, flavorings, colorings and low-quality meats, vegetables and grains. Sorry, PF Changs lovers. 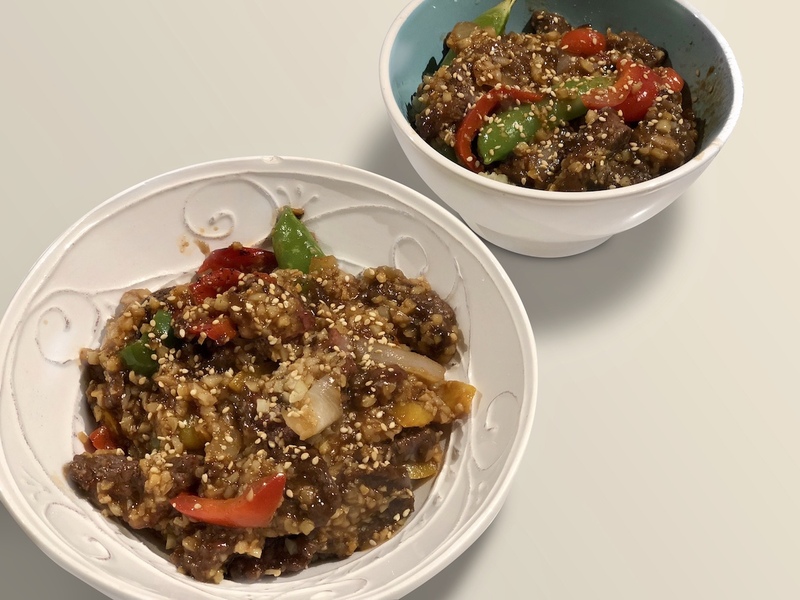 Luckily, I have created my own copycat dish that resembles a cross between Mongolian Beef and Szechuan Style Beef (if you know what either of those area). Thin slices of grass-fed beef, fried so it is super crispy and tossed in a homemade sticky sauce. It’s the combination of crispy and sticky, and of sweet and salty, that makes this dish just SO good. Top it over a bowl of egg fried cauliflower rice for the perfect weeknight Asian meal. 1) Thinly slice grass-fed sirloin steak into thin strips, against the grain. 2) In a small bowl, mix arrowroot flour, sea salt, black pepper, crushed garlic and onion powder. Coat each steak strip in the mixture. Cover and store in the fridge while moving on to prepare sauce. 3) In a medium saucepan, combine all sauce ingredients and stir to combine. Heat on low-medium heat until for 4-5 minutes. Set aside. 4) In a large skillet or wok, heat 2 tablespoons grass-fed butter over medium-high heat, when hot, lower the heat to medium. 5) Coat/toss beef strips with 2 more tablespoons of arrowroot mixture. Drop beef strips into piping hot pan and pan-fry them a few at a time. 6) When the beef strips are in golden brown crispy, add sauce and vegetables. Gently toss to combine. Cook for 4 minutes longer or until vegetables are blanched. 7) Serve over cauliflower rice and garnish with sesame seeds and spring onion.